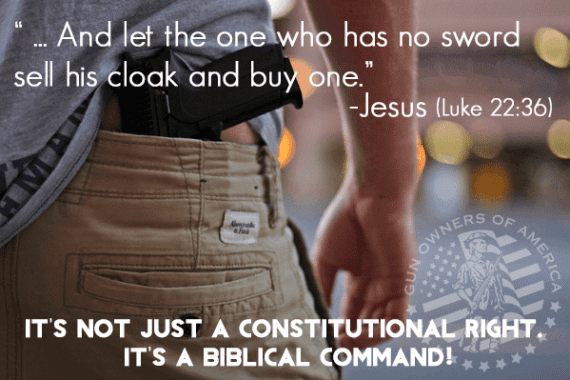 Many have wondered what to do with the above statement found in Luke 22, or have been happy either to ignore it or to cite it simplistically in favor of the right to bear arms. But it came up in my Sunday school class (at which time I found out that many present had never previously come across these words attributed to Jesus!). That led me to wonder about another possible meaning that hadn’t occurred to me before. The context is hospitality. In the past, Jesus had sent his followers out without money and food, and they had lacked nothing essential, because people welcomed them into their homes. Here, Jesus says that the situation is changing, and they will need to bring money to take care of their own needs. Could the suggestion that swords will be essential have to do less with attacking or defending themselves against other human beings, less even than defending themselves against wild animals as they live somewhere other than as guests in people’s homes, and more about hunting for food? I confess that I know less about ancient hunting than I probably should. But I’m very interested to learn more, if anyone reading this has anything to share. Personally, my instinct is to think it likely that someone did pull out a sword in the incident on the Mount of Olives when Jesus was arrested (as I discussed here on the blog back in 2014). The fact that his disciples were not rounded up suggests that this was not something the authorities would have expected from Jesus’ band and caught them off guard. But it may have sealed Jesus’ fate, historically speaking – it is at least theoretically possible that the authorities might have simply kept him out of the way during Passover and then released him, had there not been a sudden sign of how his supporters might in fact be prone to acts of violence. On the other hand, my overall impression is that the Romans wanted Jesus apprehended, and the Jewish authorities were simply getting them Jesus quickly lest they need to send troops to locate and arrest him themselves. The reference to buying swords (even if it requires selling your cloak, which is itself quite a significant expense!) often gets discussed in connection with gun control and other modern concerns. Whether one translates the response of Jesus as “that is enough” or “enough of this,” neither leaves room for Jesus having the disciples arm themselves. And having long felt that the overall point of the passage is that Jesus’ disciples previously relied on hospitality, the possibility that the swords are not for protecting or defending themselves, but for feeding themselves, would fit that nicely. Does that seem plausible to you? I always thought Luke 22:36-38 was about how Jesus would be judge because of the acts and attitudes of his disciples. Not every disciple needed to carry a sword. Even if it were only two disciples carrying swords, that’s enough to count Jesus a transgressor or criminal. Contrast that passage to Jesus reaction just a few moments later, when a disciple uses one of the swords in self-defense: “Stop! No more if this!” (Luke 22:49-51). I think Luke was using this episode to illustrate how engaging in violence, even in self-defense, brings a bad reputation to Jesus, and his whole movement, as lawless. Emphasis mine. I figured that Jesus wanted his disciples to buy swords so that he’d be arrested for starting an insurrection. Interesting! That could play an interesting role in a scenario in which Jesus is trying to act in such a way that he will be arrested. Is that what you are envisaging? Do you think that is likely the case when it comes to the historical Jesus? Do you think Luke held this view? That’s what I’m envisaging, although I’m not sure if the focus is on Jesus trying to get arrested or on Jesus trying to fulfill Scripture. He has to be “numbered with the transgressors,” at least according to Luke. It definitely puts the whole arrest in the light of Jesus being in control of the situation. When it comes to the historical Jesus, I guess that’s tricky. The gospel authors seem to be a little zealous about Scripture fulfillment, and I’m never quite sure how much of that Jesus himself passed on or how much of that is trying to make sense of events after the fact. Could this maybe relate to the desperate prayer in the Garden of Gethsemane where Jesus seems to think he needs to suffer to fulfill God’s plan? Could be. The gospels frequently portray Jesus of being aware of a need to suffer, like the occasion on which he calls Peter “Satan” for trying to talk him out of it. It seems to me that the “numbered among the transgressors” text is more likely something the early church brought in to make sense of what happened to Jesus, his execution as a common criminal, rather than something that Jesus was actively trying to bring about, as in “let me make sure I have a couple of followers with swords so that someone somewhere might just possibly find out about it and consider them and me transgressors.” If I’m correct in this blog post, merely having the swords wouldn’t make them transgressors necessarily, and Jesus’ rebuke of the violent act of a disciple keeps him from being numbered among them in any meaningful sense. I agree that the Gesthemane prayer is an interesting window into the mind of the historical Jesus. I just today did a brief blog post about it here: http://palpatinesway.blogspot.com/2019/03/mark-and-cross.html I intended my blog to mostly be about Contemporary Continental Philosophy, but I have been posting a bit about religion lately for some reason. It’s nice to have a forum to share ideas about religion even though I’m just an amateur when it comes to religious studies! John, Gesthemane and the tie into the historical Jesus seems a stretch. If true, there were no witnesses to it (Jesus was alone). And the episode of a disciple cutting an ear off, and Jesus healing it, seems rather contrived. As you often say, miracles are not likely, so the healing part is questionable. And if a disciple actually injured a Jewish Temple or Roman guard, the likely outcome was immediate death to all the disciples, including Jesus. I doubt if constraint was one of their high points. Sorry, a little too long and complicated for me. Significant statement, “Modern commentaries on Philippians rarely mention the Gethsemane story at all.“ I’d call it speculation at best. Remember, Philippians was written way before the gospels, so any exact vocabulary connection from Paul to the Gethsemane story implying that Paul knew the Gethsemane story, meant Paul knew the oral story (and the oral story maintained the exact word choices – I’d say unlikely, if Ehrman is right). I’d say it’s just as likely that the Gethsemsne story was written by the gospel writers, and they copied the key word choice from Philippians, not vice versa. But whatever. All speculation. The basic point in [Plato’s] Republic is that “righteousness” must be produced under compulsion or forced since no man will be righteous of his own accord. This recognition has tremendous implications for natural law. Now a note on the word Plato uses for “crucify.” Plato’s word is ἀνασκολοπίζω (anaskolopizo) which means “to fix on a pole or a stake, to impale”. So it is not the same word that the New Testament uses for “to crucify” but it is within the semantic domain. Perhaps these were the sorts of things Jesus had in mind regarding needing to suffer to realize God’s plan. I would add that the one big difference in the Jesus story is that in his case the apparently righteous man is crucified, but (unlike in Plato’s Republic) is then resurrected. Perhaps this is to argue a step beyond Plato in arguing God alone is able to judge a person to be truly righteous, with the righteous man Jesus being vindicated from the charge of “criminal” made by man by God through the resurrection. One thing I wonder is if the original Christians would have been more literate than they are normally given credit for. This relates to the literacy of the ancients generally, and whether they may have been influenced by literary themes from the ancient world like Plato’s Republic? And I guess as with the themes of Plato’s Republic, one need not to have read its discussion of the just person to be influenced by the themes in it, the most famous book in the ancient world. One last point (sorry I posted so much here, lol). Here is an interesting blog post I found, called Plato and the Cross, which unpacks some of Ratzinger’s thoughts about the relationship between Jesus on the cross and the impaled, just man in Book 2 of Plato’s Republic: http://vmntblog.com/2015/04/plato-and-cross.html . I wonder if Jesus is portrayed as the judge instead of God in the Gospel of John because Jesus has walked a mile in our shoes and was paradigmatically righteous, and so has the right to determine who among us is just? Masada, in the light of the Jesus cross story, could be viewed as positive, unlike Josephus’s negative portrayal. Same for Temple destruction. I guess I’ll have to get a google account to comment on your blog. May do that when I get some more time. A sword certainly isn’t a hunting weapon: spears or bow and arrows. And if Jesus wanted to be “numbered among the transgressors”, and arrested, surely overturning the tables in the temple forecourt and driving the moneylenders out would have sufficed. Maybe Jesus did in fact intend to start an armed rebellion, and the Romans nipped it in the bud? And the whole “peace and love” thing was just a massive retcon! I certainly think the possibility of retconning deserves serious consideration! In this case, though, I find it hard to imagine, on the one hand, such a radical and total redefinition of the entire “franchise” even before there is a centralized hierarchical organizational structure that has more likelihood of successfully imposing the change; and on the other hand, that the Romans were satisfied for Jesus alone to be handed over to them, and not also as many of his core band of followers as could also be apprehended, if Jesus were not known to represent a stance that was opposed to armed rebellion. I think that would make great historical fiction. I sometimes wonder if the original disciples really were as they are portrayed in the Gospels. Maybe they weren’t peasant fishermen, but that this was just a play on the idea that they were to become fishers of men. The whole story seems to play with the idea that the first will become last, and the last become first, where Jesus, an itinerant preacher from a nowhere burg like Nazareth and his band of peasants accomplish the victory of the cross and spread the message of the resurrection! Thanks for the encouragement! It is good to know that if the things I am working on turn into a novel, someone is likely to read it! I am serious about the novel. As a short story I blogged about grew to the size of a novelette, I also realized that I had some interesting ideas about how to continue the story, and was eager to pursue them. I am not sure that I am persuaded by the scenario that several apostles are killed at Gethsemane, but if I were to become convinced it would certainly be able to fit into the novel. I have a chapter started that involves the Gethsemane incident and so I will give this some more thought. Perhaps I should just take the Star Trek approach, split the difference, and have unnamed minor characters die there? That’s an interesting question. 1 Cor 15:5 says “and that He appeared to Cephas and then to the Twelve,” which may simply mean Jesus appeared to Cephas, and then the “rest” of the twelve. However, another reading could be that Paul saw Cephas as distinguished from the twelve, which may suggest something had happened to the original disciples, and so a new group of 12 was formed that was different from Cephas. Love it! On the one hand, the presemce of a denier and a betrayer among the Twelve suggests ther was such a group during Jesus’ activity. On the other hand, their precise identity on lists of names seems to vary. It would be easy to make the case that the group’s membership shifted between the time prior to the crucifixion and thereafter. I should have made clear that my suggestion of such a “massive retcon” was not intended seriously. It can be so hard to tell sometimes! A sword as a hunting weapon? Face palm. Swords, at the time were designed for close quarter combat, arms length. Wild animals run from human predators. A short/long sword would be practically useless for hunting. In addition, sword design of the day meant slashing and hacking not poking and piercing, the pointy end, while not blunt, was broader. Again, not designed to be stuck into an animal’s vital organs. There were actual hunting weapons available to the disciples but the text denotes swords, not those — spears, lances, bow and arrow, or even a sling. Let the text say what it says. It appears to me this is a case of special pleadings and an attempt to impose a bias on the text that is not evidenced. Swords were practically useless in hunting wild game and were not hunting weapons then. There were hunting weapons available then. The swords were not for hunting. They were for some other pupose. 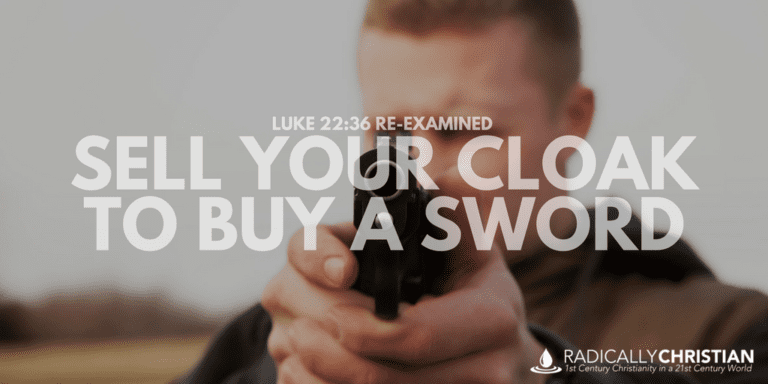 There are quite a few legitimate, moral, ethical, and righteous justifications for Christ followers to sell their coats and buy swords. I’m both saddened and shocked that you cannot come up with a single one. The Greek word used suggests a dagger or knife, not a large broadsword if that is what you are imagining. Sorry if my defaulting to the most frequent English translation misled or confused you. Your reference is misnamed “knife hunting”, when it should be named “hunting knife”. Hunting knives were used to finish off the animal once it was caught, and gutting and cleaning the animal, not capturing and disabling the animal. Your disciples would end up being mighty skinny if that was all they had to hunt with unless they went around killing local domestic animals (as thieves), or lizards – (which probably aren’t kosher anyway). If a knife and not a sword, instead of any “hospitality context”, based upon Jewish history of the times, I would expect hunting people, not animals, along the lines of Sicarii. Hard to see how a knife is connected to hospitality. The context is about hospitality. Besides, considering that Luke was written around 70-85AD, even Josephus would say the disciples were closer to Sicarii, than hospitality hosts. Assuming Josephus knew about the disciples. I see no hospitality context at all. No reason to get bend out of shape over it. Just my opinion about it. Nothing more! No one is getting bent out of shape. When I ask for input, I am interested in informed input, not the kind of heated rhetoric and serial brief comments that you seem to prefer here. The context I am referring to is the context in the Gospels, where the point is that they were previously sent out without provisions to rely on hospitality, and here the point is that the situation has changed. Heated rhetoric? Really? 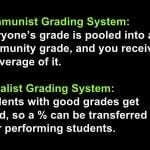 Hope you don’t use the same approach with your students, that have a different opinion. I penalize them for spelling issues, which you’ll note I didn’t do in your case. But on my blog I feel free, when it is clear that someone is trying common internet tactics just to get a rise out of someone, to respond in ways that at least make the interaction less humdrum than it otherwise might hae been. Spelling issues? I didn’t realize texting on a blog raised your spelling ire. If I am not mistaken, you admitted not knowing much about hunting, and asked for comments. I provided comments. The fact that you didn’t agree with them is your prerogative. But I doubt that it falls under the category of “heated rhetoric”. You seem to not like it when someone disagrees with you. Hi James – I commented on this topic but, can’t see how to post it in the comments section. Advise please. Hi Owen. I’m not sure what you mean. I see this comment, and so what other comment were you trying to post but unable to? What other comment section besides this one were you trying to post in? If I can figure out what you’re struggling with, I’ll try to help! James -My comment on the carry of weapons /swords as a deterrent to attack or robbery, citing the good Samaritan incident as well as an incident where a lady of our group carried a gun on her hip which discouraged further insults and harassment. I don’t find any record or notificationof such a comment, sorry. It looks like it simply never registered. Who was suggesting that a knife was the only thing they would use in the hunting process?! You don’t read your own references? Sure, but I made a point of using the terminology you recommended, and yet you seemed not to notice. It seems really implausible to me that Jesus could have been thinking about a sword as a hunting weapon, not because they weren’t really used as such at the time (which is true), but even more because swords are terrible hunting weapons generally–imagine going after a bird or a rabbit with a roman *gladius!*. It’d be comical. But does anyone know what a sort of standard traveller’s “kit” would look like in that period. Literally what anyone having to travel on food would normally have on them? Would that have generally included a sword or, perhaps more plausibly, a long knife that could be used possibly for personal defense but also for carving a hunk of meat or bread, and any/all the things that one might carry a Swiss Army Knife for today? If that’s the case, then the hospitality argument makes a lot of sense, and all Jesus is really saying is, “you’re gonna have to kit up with your own travel gear from now on.” That doesn’t rule out the idea that the weapons could be defensive, but using this as a justification for anti-gun-control legislation would sure seem like a heck of a stretch. We might say Jesus didn’t go out of his way to say “no weapons!” in that instance, but it hardly qualifies as an endorsement for your local firearm dealer. first off guns do not equal swords.Second the simplest explanation is the earliest followers of Jesus were armed most likely in preparation for the final eschatological battle between the sons of light and the sons of darkness described in the dead seal scrolls which they believed was going to occur in their lifetime.